As an Eagle Scout growing up in an adventurous family, Adam McCall was no stranger to the wonders of the outdoors when he joined the staff of Mountain Challenge in 1996. However, what he discovered about people and the way they interact turned out to profoundly influence not only his personal, but also his professional life. Learning the dynamics of a group is also a skill McCall cites as being critical for his company’s success: “Learning to not only “put up” with people that you’d otherwise never want to spend time with, but figuring out ways to rally them towards a common cause” is just as important for leading groups of college students through the woods as it is for running a business. Though McCall stays busy as a product and company developer, he maintains his enthusiasm for outdoor sports, particularly swimming, surfing, boating and wakeboarding, for which he garnered national attention and spent time competing on the professional circuit. When weather or location is not conducive to the water, he enjoys snowboarding and mountain biking. 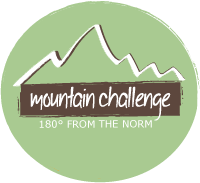 Admittedly, McCall thought he already knew a great deal about outdoor facilitation when he started with Mountain Challenge. However, he recalls, “Mountain Challenge was the first opportunity I had to truly take full responsibility for people on a course as well as to be surrounded by such a diverse group of personalities, cultures, experience levels, etc.” Negotiating, leading, and working effectively with people and the environment are skills McCall took to heart as he developed his own business, basing many of his company’s principles on the managerial foundation provided by Mountain Challenge.